Federal employees who have become injured or are disabled due to disease often are prevented from efficiently performing the duties of their position and may be entitled to disability retirement benefits. The Law Offices of Stephen J. Dunn can handle all aspects of your disability retirement process. This includes assisting you in preparing your disability retirement application, obtaining the proper medical documentation, or appealing an adverse OPM determination to the Merit Systems Protection Board. Completion of 5 years of credible federal civilian service under CSRS or 18 months of federal civilian service under FERS. Have a disability (or several) which prohibit you from performing useful and efficient service in your position. Have a disability (or several) which prohibit you from performing useful and efficient service in a vacant position in the same agency at the same grade or pay level and tenure for which you are qualified for reassignment. Disability is expected to last one year. The employing agency was unable to make reasonable accommodation for your medical condition. You have not been separated from your agency for over one year. If you are currently receiving compensation pay, you may elect to receive your disability retirement annuity payments, upon approval, at any time. If OWCP decides to terminate your benefits, you can then elect to receive your annuity. Once approved, you may work another job as long as your salary does not exceed a set amount. Upon election of your approved annuity, you are eligible to receive a Schedule Award. If you are a federal employee intending to file for disability retirement or if you wish to appeal a decision by OPM denying your claim, you should consider seeking the advice and counsel of an experienced law firm. 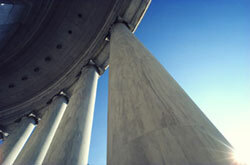 Contact us today to see how our experienced federal employment law firm may assist you.